Anything that your heart desires for winter activities and in a winter getaway, in general, can be found in Mt. Washington, New Hampshire. The tune, “walking in a winter wonderland” will linger in your mind while you are enjoying everything that cold temps have to offer. Are you ready to conquer the challenging winter climb of Mt. Washington? This peak is legendary in New Hampshire’s White Mountains. There are gifted and fit guides who can lead you to make the journey. You can experience their state of the art and famous mountaintop weather station. At 6,288 feet, you can see what it is like to work from this locale and broadcast the temps to the world. There, you can speak with the scientists and observe the equipment and just how they create their legendary forecasts. Skiing is also on the slopes of Mt. Washington. From Tuckerman Ravine (not for the faint or novice skier) to New Hampshire’s largest ski area, Bretton Woods with many trails for various ski levels, to more resorts dotting the mountain, there is no shortage of winter playgrounds. Skating, hiking, and winter strolls are also plentiful. Of course, you can always take part in my favorite winter getaway activity…finding the best hot buttered rum and hot chocolate in the area. Mt. Washington is a place where you need to plan out what you wish to do on your winter getaway and take the lodging planning from that viewpoint. Do you want to to be nearest to the observatory, a particular ski resort of just luxury travel while experiencing all winter has to offer? 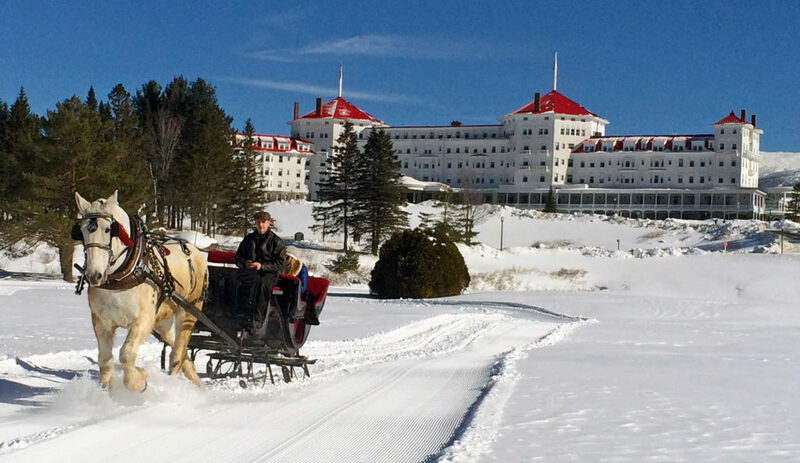 The four-star Omni Mount Washington Resort certainly falls in the luxury category, but there are so many quaint smaller properties that the choice really will depend on what you want out of this trip. The resorts, both lodging and skiing, have you covered for great food but if you are traveling the beautiful White Mountains, you will find roadside treasures too. Hearty fare is what you will need and enjoy here! In our beautiful and much envied Adirondack Park lies the idyllic town of Wilmington, a town in Essex County, about 15 minutes from Lake Placid village. Depending on your age, you may remember, as I do, traveling after Thanksgiving with my family to Santa’s Workshop in Wilmington. I just had to get there and see Santa before he got too busy! Besides being Santa’s home, it is also home to the famous and infamous Whiteface Mountain. The mountain is famous for the Olympics as well as being a training ground for some terrific, world-class skiers. The trails are certainly good for the novice and the expert alike, and the views while you are skiing, are for all levels of enjoyment. 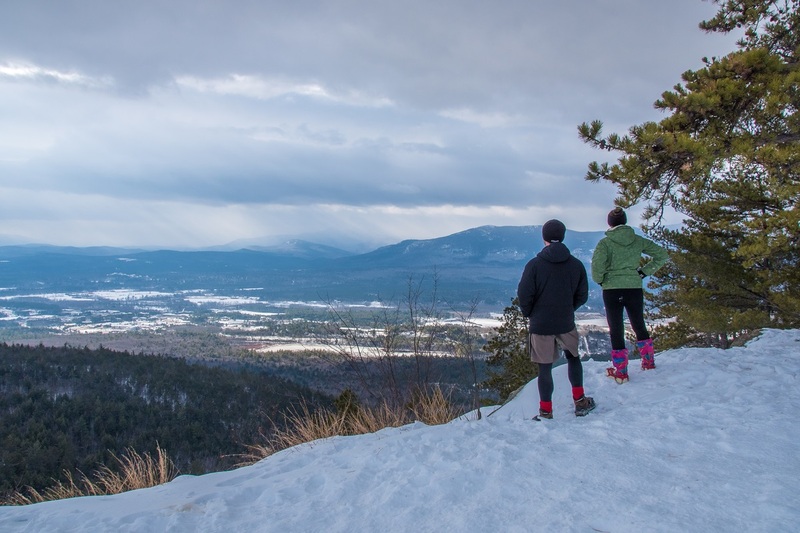 These vistas are magnificence that we, from upstate New York, know well…you are skiing in the heart of the Adirondack Park. If you don’t ski, at the very least, take a chair ride up and appreciate the splendor. 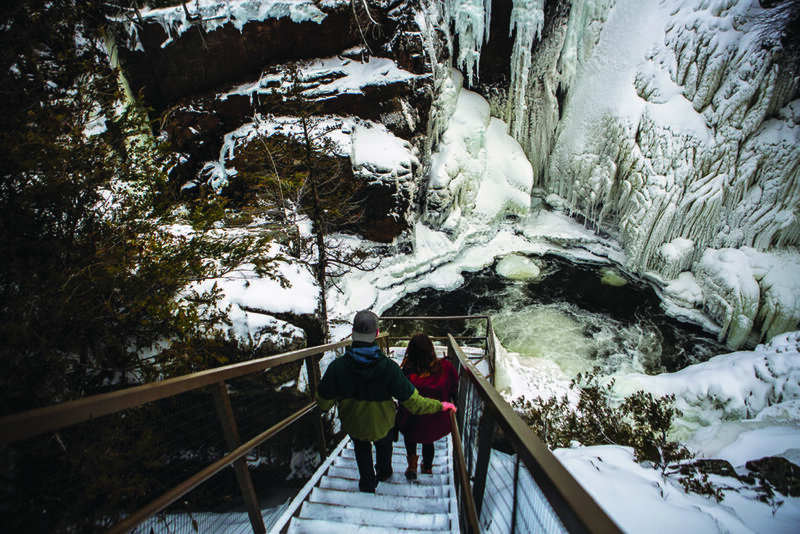 Hiking the stunning Winter Waterfall Walk at High Falls Gorge is very doable for the newest hiker among us. The views are chiseled from peaks and crannies with waterfalls cascading throughout the walk. Each season is amazing to see at High Falls Gorge but winter…well that is where the Adirondacks shine and glitter for our attention. Are you a spectator or an active participant? Ice shows or ice skating at the Olympic arena are available. Ski jumping and bobsled viewing can be available if you schedule your trip accordingly and it is all nearby. Lake trout, hearty steaks, soups, and wine galore are available to you. This is not an area for fancy dress; this is great food in your snow gear. There are no pretenses here, and that makes for a very relaxed getaway. Little cabins, private homes, and motels dot the town of Wilmington, and down the road a bit is the off-the-charts Mirror Lake Inn. 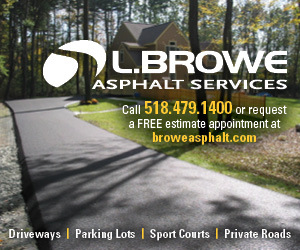 If you want luxury Adirondack style, this is your place, and it is only a short drive away. Niagara-on-the-Lake in Ontario, Canada leaves travelers with a feeling of calm and surprise. With their agricultural roots, wineries that strive to get better and better each season, and gorgeous vistas, it is an excellent choice for a winter getaway. The center of town (which is the shopping area) is the Heritage District. The Heritage District is rich in architecture and history to enjoy as well as quaintness overload. 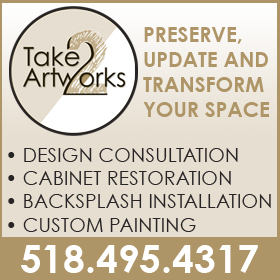 Photo courtesy of The Tourism Partnership of Niagara. Lodging options are plentiful from historical yet quaint bed & breakfasts to lovely private vacation homes to five-star hotels all available for lodging. The deep agricultural roots make for enjoyable dining. Young and creative, the chefs in Niagara-on-the-Lake shine. Sure, you can get cafe and pub fare but try out some of the more elegant restaurants for some striking pairings of their award-winning wines and beautifully prepared food from local ingredients all year. Serious about wine is an understatement. With the teaching winery at Niagara College located at the foot of the slope, this campus is breathtaking. “This is where the winemakers and viticulturists learn their craft,” writes Niagara College. Spend some time on the Niagara-on-the-Lake campus touring the winemaking facility. You can also tour their greenhouse, hike the wetlands ridge trail and dine at the Culinary Institute dining room. I am not sure if you should visit there first or last on your winery tours but know this… there are many great wineries to visit. Shop, dine, drink great wine and enjoy this beautiful Northeast gem.